Ah...the pleasures of waking up with skin that looks better than when you went to sleep. It's possible with The Estee Edit Pink Peony Overnight Water Pack, which is an overnight sleeping mask/moisturizer that is one of my favorite new skincare must haves. The Estee Edit Pink Peony Overnight Water Pack is pale pink and has a creamy-gel consistency, which is concentrated, so I only needed about a dime's worth for my face. The feel when it immediately touched my skin was like water, but it soon turned to a more creamy texture. The Estee Edit Pink Peony Overnight Water Pack is so effective because it's packed with Pink Peony, gogi berry, blueberry and cranberry which help to soothe, smooth and brighten skin, while also hydrating without a greasy feel. It also has a pretty, light, Peony flower scent which I really enjoyed and was not overwhelming. The water pack was easy to spread on my skin and absorbed within seconds with no sticky or tacky feel. It didn't leave any traces on my sheets/pillow cases over night. In the morning I was very impressed. My skin was as soft as a baby's and with a beautiful glow. My drier areas like my cheeks were supple and hydrated, and my combination areas did have any extra oil, but just a fresh, healthy glow. 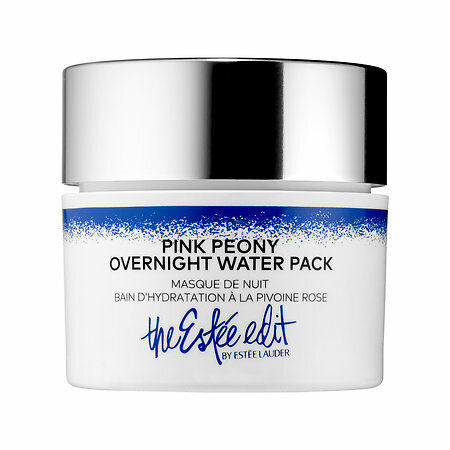 The Estee Edit Pink Peony Overnight Water Pack was gentle and non-irritating and didn't clog my pores.